This month we celebrate our 4-Year Anniversary! We reflecting on our biggest celebration of icons, stars, stories and testimonials, featuring David Paul and Elisabetta Russo. David Paul, featured on this month’s front cover, represents our ideals with his persistence to stay true to himself against assumptions and misconceptions. He has earned our respect because we welcome all creative artists from around the globe bursting with amazing stories of struggles, and triumphs of success in numerous disciplines. It’s amazing how many successful artists come from troubled pasts, and who raise above all challenges and embrace those challenges as sources of empowerment. Our special guest featuring Elisabetta Russo, whose continuous efforts and dedication to her music has taken her from the shores of Italy to the Hollywood stage, where she has performed amongst some of the finest living performers in Opera today. The entertainment industry can be very complex and misunderstood. Our goal is to highlight the artist’s success to encourage the rest of us to triumph over adversity, and help the up-and-coming professionals find their way, and to turn their stories into a positive and educational journey. This is what separates SOHM from all other publications in Hollywood and worldwide throughout the arts and entertainment sector, since 2012. We’ve featured 172 industry professionals in the past four years and have done our best to showcase celebrities you will easily recognize, along with lesser known, yet equally successful, entertainment personalities. They are all successful in their fields and give back to their communities—one of the important requirements needed to be featured in our publication. SOHM allows worldwide cultures to blend into a positive readership that promotes communication and relationships, by sharing real stories from the real people of Hollywood and around the world. We do our best to promote positive true stories that support hard work and strength in the entertainment industry, to demonstrate to our readers that dreams can be fought for and achieved. When you read SOHM, what you read is the product of countless meetings, phone calls and emails with the SOHM team. My role includes suggesting and selecting feature ideas, approving layouts, choosing photographs and signing off finished proofs. All in all, the experience has been unprecedented and rewarding. SOHM marks the first time I have ventured into the brave new world of entertainment industry publishing. Today, film, television, music, beauty, fashion and the arts, unite us, and that includes our diversity. SOHM has always been about building a platform for the community—for both the indie and established segments of the entertainment industry, to provide insight, balance and accuracy to our stories where it matters the most. I would like to remind you the vision of my contribution to the world, clearly stated in SOHM’s mission statement: We are dedicated to providing a positive, meaningful and educational experience and to inspire our readers with knowledge and information from creative, qualified industry professionals. I believe it’s vital to our community that we have a way to share stories and learn from one another regardless of race, religion, political beliefs, or sexual orientation. We all belong to one human race. More than ever before in human history, we share a common destiny. We can master it only if we face it together. The magazine also provides a showcase of the best ideas across all areas of consumer culture; an exploration of the techniques behind the work, and insight into the people and trends shaping the industry. Exclusive interviews with celebrities and non-celebrities, have contributed some exceptional “tips” for our readers to learn from. There are a lot of young professionals who can take notes for their own success! That’s what Shine On Hollywood Magazine is all about: to express the “real people and stories” of Hollywood to the general public and popular culture worldwide. My next goal is to start a non-profit arm of SOHM that will be used as a training ground for students to gain knowledge and to inspire them towards their dream of being a professional in the entertainment industry; to give them hope that dreams are goals waiting to be accomplished. The purpose of this magazine is to connect knowledge, tools, training, and motivation and to counteract the overexposure of negative news and information with solution-oriented messages of insight and hope. You’ll find diversity and standards in our features. SOHM is a place of respect, integrity, wisdom, and principles—presenting talented people with messages to encourage and empower young professionals and readers, to help them turn their dreams into reality. People do not achieve their dreams because of unclear goals. By reading our features, they will learn how to set their goals and use SOHM as a guidebook, by learning from the successes of individuals in the entertainment industry who have achieved their goals and made their dreams come true. My primary focus is to encourage our readers and show them dreams are attainable. Each issue of SOHM is theme-based. However, we also have features that provide inspiration from practical stories. The focus of the segment “Share Your Shine, Tell Your Story,” is available to the people in the arts or pop culture community who are making a difference by giving back to the community, and who would like to share their stories with you. Our society is changing every day. As a leader in the entertainment industry, I feel it is my responsibility to share others’ success to help guide our readers in a positive way, and at the same time encourage others in the industry to do the same. I aim to promote community service and instill a strong work ethic with morals and values to our readers. I want our readers to respect their craft and respect the entertainment industry. There are too many bad role models that are guiding our youth in the wrong direction; it’s time we make a positive change for them and the future of those to come. SOHM is part of our history and a part of our future. There are many more great things in this issue, but I will let you discover them for yourself. We have many exciting additions to the magazine stored ahead. We’re working on a live talk show which will be highlighting all the good in the entertainment industry, just like the magazine does. The show will feature guests who live in the spotlight, and those who work tirelessly behind the scenes to make the magic happen. They will share their journeys, as well as advice about how you can start or continue your journey in the entertainment field. These will represent all the disciplines we include in our magazine: film, television, music, art, fashion, ethnic diversity and anything else we feel will help our readers learn how they can excel in the business, and give back to their community where it is most needed. It has always been my goal to use a variety of formats to spread the word about all the good that is happening in the entertainment industry. Not just in Hollywood, but around the world as well. We at SOHM feel like our readers are ready for good news about celebrities and successful entertainment professionals, and are ready to discard the gossip, politics and negative stories that flood the world today. That’s why we are growing at such an unbelievable rate across the globe. Don’t forget that you can go back through these last four years of archived issues, read the stories and gain that much more insight into entertainment and philanthropy. Finally, I would like to thank those who have served on SOHM’s staff—the interns, volunteers and committees during the past four years—for providing the support and feedback necessary to find, develop and publish material of such consistent high quality. I hope that we can build on, and persist with our success and continue to expand the reach of SOHM for the benefit of the community. I would also like to thank you, the SOHM reader, for sharing my adventures during the past four years. To all of our advertisers, I am truly honored and thankful. Your support, enthusiasm and encouragement toward my work will continue to be a driving force of inspiration for me. Lastly, I would like to take a moment to thank my staff. 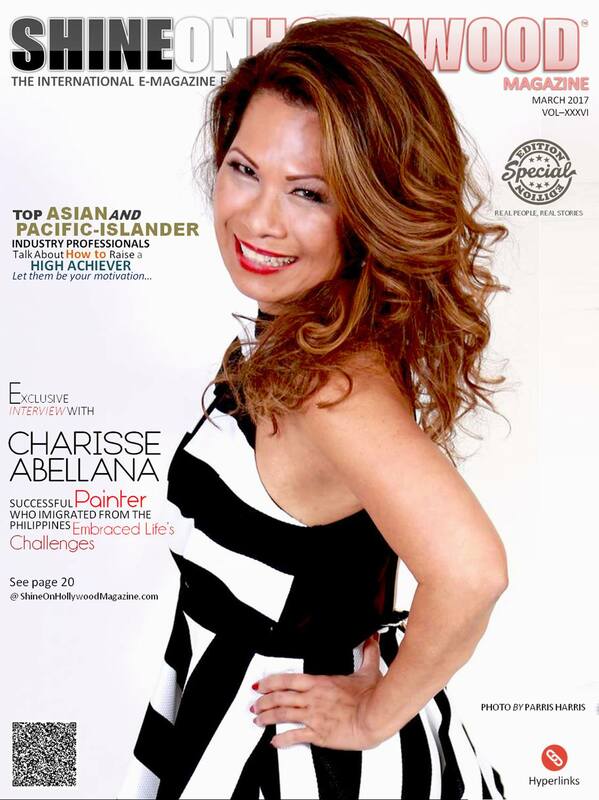 Their tireless effort to bring the stories to you, the readers, makes this magazine what it is today. The interviews, reviews and all the other pieces that make up Shine On Hollywood Magazine are due to a group effort where we support, encourage and heap praise on each other for continued jobs that are exceedingly well done. No other publication can match or tell stories like SOHM does. Because we include video embedding and all the necessary hyperlinks to the artist’s social media channels, website, store and more with measurable results. As we all know, print is becoming obsolete. 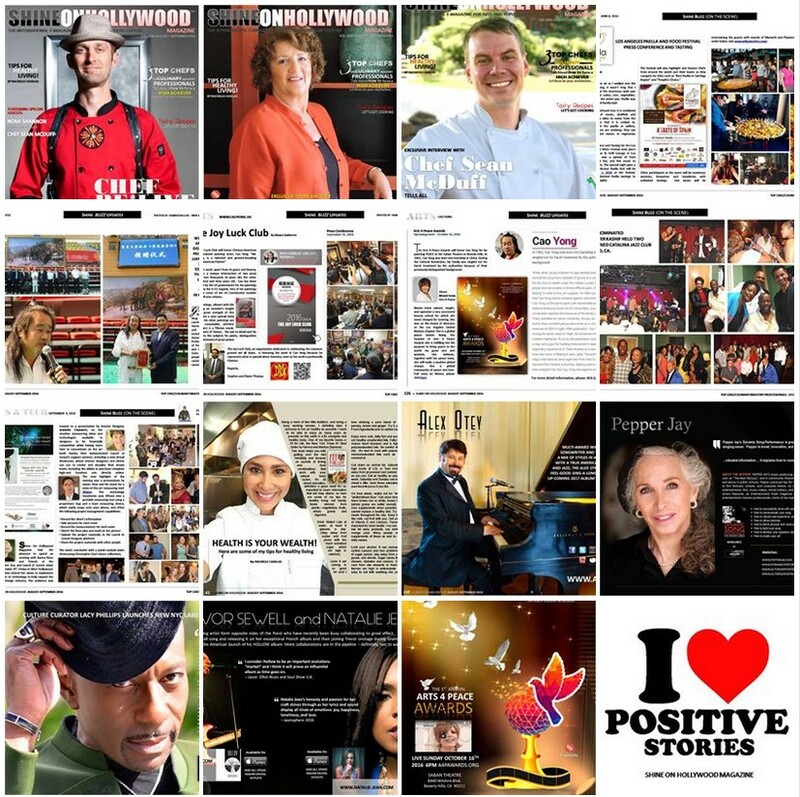 Shine On Hollywood Magazine the 100% GREEN publication in pop-culture, lifestyle, arts and entertainment. Digital is the best vehicle to drive anyone’s stories, articles and updates—information that goes viral in seconds! For more information on our digital marketing solutions, please contact Rachelle Casillas at rachellec@shineonhollywood.com or Alex Antonino at alex@shineonhollywoodmagazine.com. I’m excited about our fourth year and all that’s in store for our readers, and soon, our viewers. Next month we will be featuring Top Culinary Industry Professionals where as always we will feature major players and chefs, right alongside the important work and creative projects from independent and major production companies. We hope you enjoy this special SOHM 4-Year Anniversary Issue and we look forward to your continued support for our success. One last thing to all our readers—be part of SOHM’s success! Send me your testimonial and we will publish it. This month’s cover story pays tribute to an extraordinary individual that has touched our hearts and soul: Andy Fraser. Not only was he an amazing talent, the chief architect of a signature blue-rocks style that has influenced generations of rock n’ roll artists, but he was also a true humanitarian. You won’t want to miss out reading this inspirational story. We continue to present our Share Your Shine, Tell Your Story segment. If you or anyone you know is giving back to the Arts or Pop Culture Community or any great causes and would like to share your or their story with our readers, please do not hesitate to send us these important stories so we can share your shine with our readers. The upcoming October issue will feature an emphasis on “Top Youth Industry Professionals.” Look for exclusive interviews with leading industry professionals. We hope you enjoy this issue and look forward to your feedback and continued support! Furthermore, our digital format has enabled an average of 27 million viewers in 60 countries throughout 2014 worldwide. This growth has been tremendous and continues to delight everyone that’s involved in assembling the publication. The hard work in the features promoted, the layout of the magazine and the artistic quality that’s demonstrated every month, is a testament of the devotion we have, in offering you a publication nowhere to be seen on the market today. In order to keep the integrity of our magazine beyond any attempt of manipulation from outside sources, we are asking for your support. We are asking for donations of any amount in order to keep SOHM alive and thriving! Since the first day of operation, we have been on a shoe string budget and bartering with other companies to help us with the costs that are required for an online digital publication. After 3 years under our belt, the future and the success of Shine on Hollywood Magazine rests on the generosity of our faithful readers across the globe. We have made a difference by our sincere efforts in offering a unique publication where politics, gossip and prurient content are not included. The only focus SOHM has is to enlighten our readers to enjoy and come to a realization, the entertainment industry in Hollywood and worldwide is reflective of a spirit where talent is universal. Our reward through your contributions will continue the desire we all have, to make our magazine a force for good. We encourage you to donate any sum to our beloved magazine. HERE WE ARE. YEAR NUMBER THREE! It’s been exciting and enlightening and a year more than I could have ever imagined. The outpouring of love and support from everyone, in the United States and beyond, has been overwhelming. In celebration of our 3rd anniversary we are featuring two amazingly talented and beautiful human beings. On our cover is Nia Sanchez. She went from living in a homeless shelter with her mother as a young girl to winning one of the most coveted and respected titles, Miss USA. Her grace and beauty are apparent but her amazing soul is what inspired us. She continues to do volunteer work in the same homeless shelter where she lived as a small child along with other charitable work she does for causes that are dear to her. We were so grateful to have had the chance to interview Nia before she handed over her crown, just days ago, to the new Miss USA, Olivia Jordan of Oklahoma. We congratulate Olivia! This issue also features another marvelously gifted spirit, Couturier Celebrity Designer, Sonia Eté. Her extraordinary professional journey has encompassed dressing celebrities like Jennifer Stallone, Tracy Danza, Jennifer Lopez, Paris Hilton, Coolio, designing luxury apparel, fine jewelry, embroidery, luxury leather goods, luxury pet accessories and owning a chain of fine-gems jewelry stores. In addition, understanding the need for Couture in the United States, Sonia brought French Couture education by founding the reputable Academy of Couture Art in Beverly Hills, with the mission to continue the Legend of Couture through training young creators. We hope you enjoy her insightful interview with us into the world of this extraordinary high-end fashion. This last year was bursting with amazing stories of struggles and triumphs from successful artists in many disciplines. It’s incredible how many successful artists come from troubled childhoods. Our goal is to highlight their successes to encourage the rest of us to triumph over adversity and help the up-and-coming entertainment professionals find their way. We have featured 24 industry professionals in the past year and have done our best to showcase celebrities you will easily recognize along with lesser known, yet equally successful entertainment personalities. They are all doing the good work and giving back to their communities. With sadness also, we lose a loved one. Such was the case with my friend, Arlene Martel. A prolific and talented character actress known for her roles in Star Trek, The Twilight Zone, I Dream Of Jeannie and countless others on stage, screen and in film she was, above all, a kind and vibrant human being. As I spent time with her simply enjoying coffee or going to a movie together, I discovered a friend that never knew boundaries when it came to positive and encouraging words. It was a joy to honor her in our April 2015 edition. We have also kept abreast of some of our all-time favorites, such as World-renowned artist, Cao Yong. He overcame soul-crushing adversities to become one of the most sought-after artists of our time. It has been wonderful to be able to present some of his beautiful artwork in various issues throughout this year. It has always been and will always continue to be my goal to use a variety of formats to spread the word about all the good that is happening in the entertainment industry. Not just in Hollywood, but around the world as well. We, at SOHM, feel like our readers are ready for the good news about celebrities and successful entertainment professionals and are across the globe. Don’t forget that you can go back through these last three years and read any of the archived issues, see the stories and gain that much more insight into the entertainment and philanthropic businesses. The upcoming August issue will feature an emphasis on the music industry. Look for exclusive interviews with leading industry professionals. We hope you enjoy this issue and look forward to your feedback and continued support! I am excited about our fourth year and all that is in store for us and our readers! This month’s cover story features the world renowned artist and humanitarian, Cao Yong, a man who truly paints from his heart. It has been said that to view one of his paintings is like getting lost in a beautiful and magical place. His life journey is remarkable and his paintings can’t help but to inspire you. His new work, “Peace” with a world-wide premier in China next month, embodies Cao’s desire to shine a light on the damage we are doing to our world and what we need to do to correct it. This month’s issue also features orthopedic surgeon, humanitarian and blues musician, Dr. Dan Ivankovich. He is a true renaissance man who has chosen to use his intellect and talent for the betterment of his fellow man. You won’t want to miss out on reading about his fascinating work. 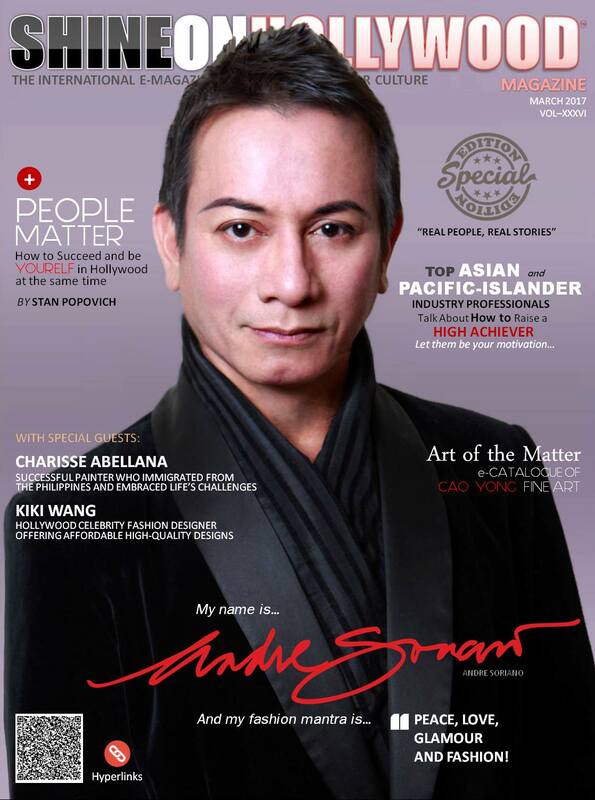 This issue also features Kenny Santiago Marrero, who is known by industry insiders for his versatile acting ability. We learn how education and determination made the difference for him in reaching his goals and dreams. Finally, we are proud to feature successful entrepreneur, musician and celebrated winemaker, David Hunt. This man of many talents actually achieved many of his goals after losing his sight. His story is like no other. 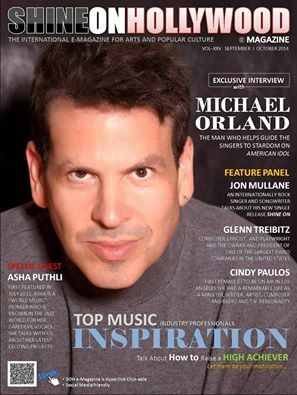 The upcoming January 2015 issue will feature “Top Dance Industry Professionals.” Look for exclusive interviews with notable leaders in this industry. We hope you enjoy this issue and look forward to your feedback and continued support! Wishing you the happiest of holidays and joyous New Year! Contact our advertising digital solutions sales and marketing team for more information and to receive our 2015 Corporate Media Kit.